Posted by Benjamin Dell on Feb. 25, 2016 . First things first; we're incredibly late to the game on this one. I've always intuitively known that the more you understand your customer, the better a position you're going to be in. It will then be far easier to anticipate their needs, communicate with them and fundamentally tailor your marketing language and pricing towards their particular biasses. Of course, but for some reason it took me 2 years to take this part of the jigsaw seriously! As a founder, you can easily become fatigued with the vastness of information, advice and 'hacks' out there. So much so that it can stunt your growth. Like a rabbit caught in the headlights, we sit there partially paralysed. Focusing on the more exciting tasks or the obvious low hanging fruits can become your daily diet. In this article I want to share with you how and why we put our buyer personas together as well as a few useful resources we've found along the way. In essence, a buyer persona is a semi-fictional (more on this in a second) representation of your ideal customer. They should ideally also be given a name. This might seem silly but it's actually important. We want to strike up a relationship with this 'person' and get to understand them. Most importantly though, we need to align our entire company on who these target customers are and how they behave. As a business owner, I need to know who our target customers are, but so do sales, marketing and the product team! Properly thought out buyer personas can help inform a wide range of decisions. Pricing, marketing language, on-boarding approaches and many other decisions become far easier to make when you have an established 'persona' to judge your decisions on. What you might find enlightening is to simply ask yourself whether the language you use on your landing page 'speaks' to the personas you've put together. In many cases it does, but you'd be surprised how frequently you spot copy that just feels at odds with your target market. One thing I discovered when I first started putting our target customer list together, was how easy it was. Our product can be used by anyone I thought, and so I started listing every combination of customer I could think of. Don't get me wrong; if you find yourself in this position, it's great to see how potentially universal in appeal your business could be. But stop! The whole reason we're putting buyer personas together is to gain focus and clarity. A list of 3 target customers is far more powerful than 10. In fact, i'd strongly recommend that you keep your list to no more than 3 or 4. I know, the names are cute right? We want them to feel like real people (albeit, categories of people) that we can then start focusing our product around. I find it embarrassing writing this, but although I always 'knew' that our ideal customer would probably be in one of those three categories, I hadn't once formally documented or thought about it to any real extent! This is where the 'semi-fictional' term used above now comes into play. In an ideal world, once you've defined your ideal customers you would then undertake some meaningful market research so that you can learn what the goals, challenges and willingness to pay (to name but a few) actually are for each customer type. Real, empirical data will help you make far more meaningful decisions moving forward. With that being said though, I feel pragmatism has to come into play as well. My general approach in these sorts of cases, is to just do 'something' to move forwards. We don't want to regress back into a position where we're paralysed to make any decisions. To this end, my strategy initially was to simply create 'buyer personas v1'. I decided on our 3 base types and then spent a couple of hours thinking about what their demographics, background, goals and challenges might be. My goal was to create a first version, so that I could share my thoughts with my team and align ourselves. Remember: at it's core, a buyer persona is there to help align a companies collective understanding and focus; so that meaningful, informed decisions can then be made on the micro level. By being (initially) pragmatic on how you complete buyer personas, you will be able to reach alignment far more quickly. Price Intelligently wrote a fantastic blog post and accompanying video on the wider subject, which i highly recommend. 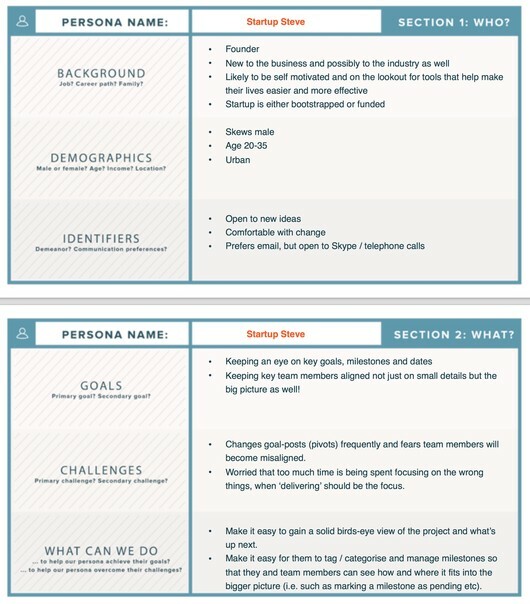 We also used a neat persona template from Hub Spot. With all of my ramblings above about reaching alignment and being pragmatic; we also need to be realistic and understand that all I currently have are best guesses. Our challenge now is to enrich each persona with evidence based data. I suspect this will be your next job as well. One of the first things I'll be doing is adding a couple of questions to our sign-up form. How many employees / team members do you have? I'll then be able to use this information to segment our survey responses (which I have now updated to include questions that can then directly filter back into our buyer personas). You might want to do something similar in your sign-up process. Or perhaps you've already been asking this of your new users. If so, what's your next step? I'd love to hear from you. It's our mission to measure, iterate and improve... one metric at a time! We're on a journey from zero to $20k in Monthly Recurring Revenue (MRR). You can follow the full story behind our goal to improve Visitor to Sign-up Conversion or head here to see what else we're focusing on.